Hey everyone, what are some guitars that you wish Squier would make? Either brand new, Squier versions of Fenders, or something new and original? Personally, I think it would make a lot of sense for Squier to start production on the Jagstang. In my opinion, Nirvana is one of those bands that has fans of all generations, especially younger generations. At some point in life, it seems every kid or teenager (even today) discovers Nirvana. With the Fender version long out of production, they are pretty rare and pricey to find. I think that a Squier version would sell like hot cakes to both new and old Nirvana fans. I also really wish they would make a Squier version of the Jim Root stratocaster. I know they make the telecaster version, but I've never been a huge fan of the tele shape. His Fender all black signature strat is one of my dream guitars but at 1500, it's out of my budget at the moment, but I'd be happy paying around 4-500 USD for a Squier version. Las Palmas Norte, SquierTap and ManKonis like this. yup, would like a squier jagstang reissue. maybe a new vista series? Tamarindo03, VealCutlet, SquierTap and 3 others like this. first response and exactly what I wanted to say. Jags tang and vista! SquierTap, TheKurdtz and stratman420 like this. The Courtney Love Venus guitar was part of the Vista series, correct? Where there any other models in the Vista series? RoyalWe, SquierTap and TheKurdtz like this. In 1996 Squier introduced the Vista Series, which unlike previous Squiers, were not created as budget guitars and were largely original designs. Three Vista models were produced; the Jagmaster, the Super Sonic, and the Venus six- and 12-string guitars. The Jagmaster is loosely based on the Fender Jaguar and Jazzmaster, but with Gibson-style humbucking pickups, a Stratocaster-style vibrato, simplified electronics and, on the Vista series version, a short-scale neck (24 inches, the same as on a Jaguar). Launched in 1996, the Jagmaster was built for only two years. The earliest Japanese Jagmasters employed a truss rod that is adjusted from the bottom of the neck, while later guitars have a 1970s-style bullet truss rod, which is adjusted at the headstock. The earliest guitars sometimes feature a “Fender 50th Anniversary” decal on the back of the headstock. Due to Japan’s economic crisis during the late 1990s, Fender closed the Japanese plants in which the Jagmaster was produced. However, in 2000 a Chinese-built version with a 25-1/2 inch scale neck was released. In 2005, that version was discontinued and replaced with the Jagmaster II, which reverted to the short-scale neck. 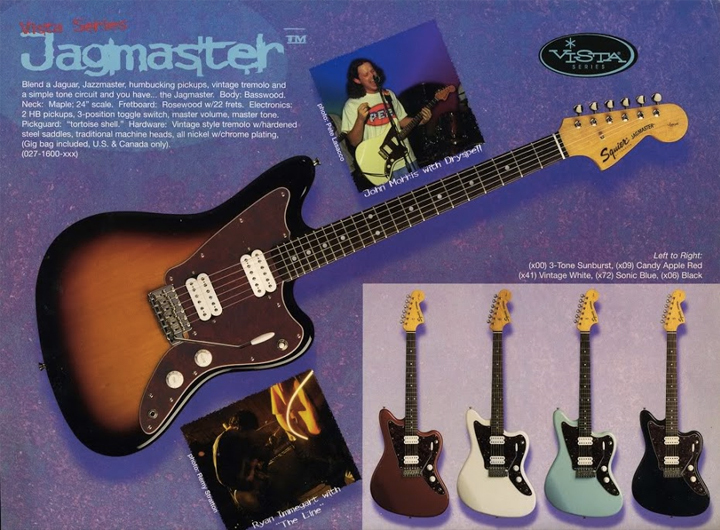 The Squier Jagmaster in the Squier Vista Series catalog. 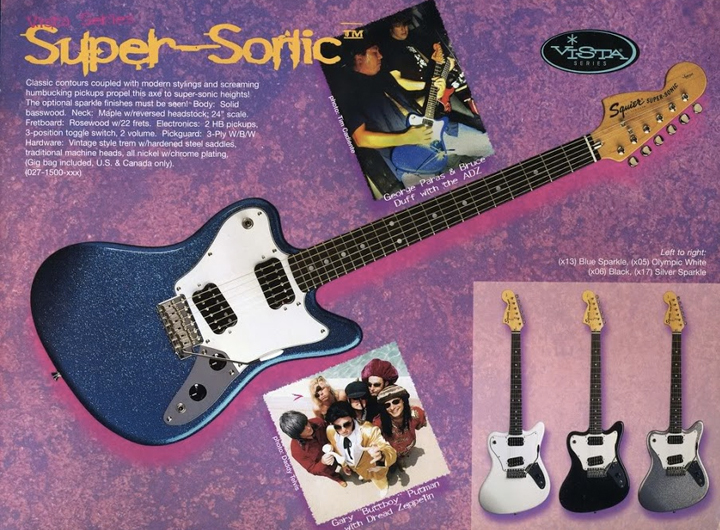 Probably the most visually striking Squier Vista design was the Super-Sonic, which was essentially Jagmaster with a reversed body shape. This creation of a new guitar by turning the body "upside down" is highly reminiscent of what Gibson did in the 1960s with their two styles of Firebird guitars and Thunderbird bases – both of which were inspired by the offset body shapes of the Fender Jaguar and Jazzmaster guitars and Jazz bass, thuds making the design of the Super-Sonic somewhat tongue in cheek. The Super-Sonic had no tone controls but instead utilized two volume controls and a three-way toggle switch for pickup selection. The Squier Super-Sonic in the Squier Vista Series catalog. The Venus was designed as a quasi-signature model for Courtney Love, then the rhythm guitarist in the band Hole. The shape and configuration of the guitar was based on a personal instrument of Love's, a "Mercury" model created by Atlanta, Georgia-based luthiers Danny Babbitt and Tim George. Although visually similar to the Mercury, the Venus was significantly different in construction, having a bolt on neck and the standard Fender six-in-line tuning machines as opposed to the Mercury's set-neck construction with three-a-side tuners. Notably, the Venus has a rounded headstock very similar in shape to that used on Fender's acoustic guitars and Coronado electrics of the 1960s and early 1970s. The Venus was also available in a 12-string version, which employed bifurcated pickups similar to those used on the Fender Electric twelve string model of the 1960s. 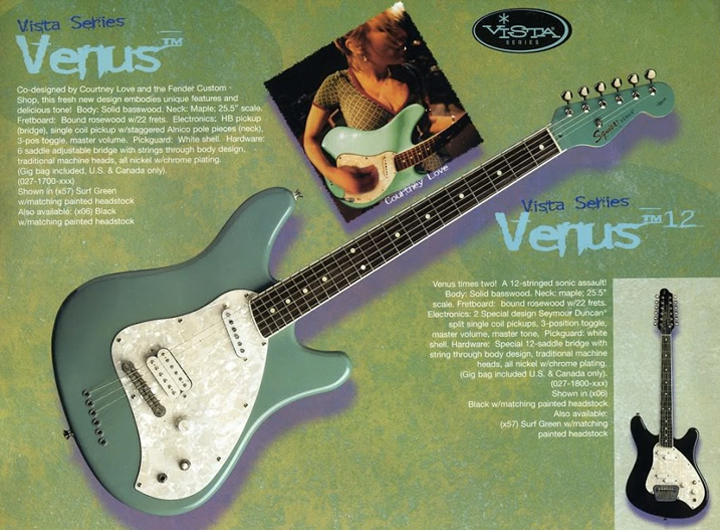 The Squier Venus in the Squier Vista Series catalog. Loin Lover, optofonik and stratman420 like this. Las Palmas Norte, SquierTap, johnnywizzo and 1 other person like this. This is out of Fender's wheelhouse, but Squier is also an experimental brand. Las Palmas Norte, newscaster, VealCutlet and 1 other person like this. stratman420 and SquierTap like this. Cabronita with two p90's.Cabronita with three p90's. stratman420, VealCutlet, SquierTap and 1 other person like this. EDIT: There are NONE for sale on eB@y, and a single blue flake RH in "good" condition for $1100 on Rev3rb. stratman420, SquierTap and optofonik like this. Count me in on the "reissue the Super-Sonic" train. I'd scoop up a sparkle blue one for sure! stratman420, SquierTap and -r3- like this. A Squier version of the Powerhouse Strat would be really great. Las Palmas Norte, Stratlover84, stratman420 and 1 other person like this. BlueSquirrel, stratman420, SquierTap and 2 others like this. bigal1000, stratman420, RoyalWe and 1 other person like this. Reissue of the mid 80's MIJ Contemporary Strat. 24 3/4 (Gibson scale), no pickguard, black headstock. I heard people call them "Royal" Strat, but I don't recall it saying that on the headstock. I sold mine the 90's like fool. It's not a new design, but I think they'd have a winner by making the Telecaster Custom II, again. Enough people have figured out how cool that P-90 tone is in a Tele. daan, stratman420, RoyalWe and 2 others like this. Beat me to it. I second this. anything remotely 335 shaped will eventually make it into my house. Davis Sharp, stratman420, SquierTap and 2 others like this. Jackal, Las Palmas Norte, Stratlover84 and 1 other person like this. stratman420, Tamarindo03, SquierTap and 1 other person like this. daan, stratman420 and RoyalWe like this.